I have a nice Sony HDR-SR11 HD handycam. With this great camera a tool called PMB which I use to import the videos from the cam to the harddisk. The tools have a nice Calendar view, which show the video chronological. And here is the problem. I determines the created date from the files created date. Fine, BUT when importing the videos a folder with the current date is created, all video placed into that folder with at creation date = current date. Noooot good. Luckily the handycam incorporates the exact shooting date in the filename down to the second, so I created a small utility to take the date from the filename, and correct the creation date / shooting date. Requires Windows xp/vista/7. mono-capable linux’s with .NET Framework installed. 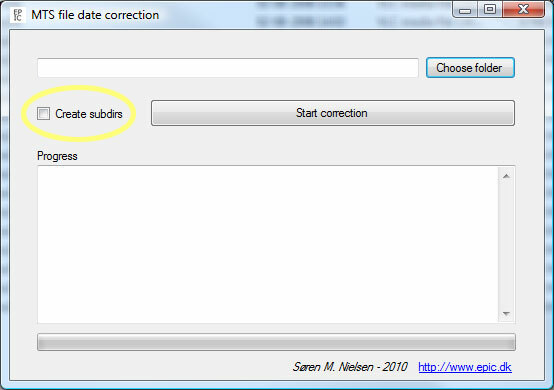 Next, choose if the program shall create subfolders (eg. 2010-09-10), and copy place files there. The program is free of charge, and without ANY warranty, and I cannot held responsible for ANY data loss, missing files or ANY form for damage to your files. In other word USE IT ON YOUR OWN RISK. Remember alway to make a backup. (just copy the files elsewhere).